This is the first Bulgarian project funded through this component and one of the nine to be selected from the whole of the European Union in the 2012 call. The activities, products and results of the Project are presented in the Layman’s Report. 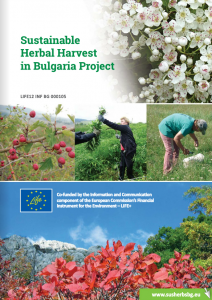 The Medicinal Gold of Bulgaria is a story about how the abundance of valuable medicinal plant species can give livelihood to the population of the regions where their habitats are located and bring economic benefit to Bulgaria. The film presents good examples of the sustainable use of medicinal plants in the country. The story of the herbs’journey from the field to us – the consumers, is told with the participation of collectors and entrepreneurs from the whole value chain. It clarifies the correct way to collect herbs, what kind of processing they go through and how the beneficial substances they contain are extracted and used. The correct collection, primary processing, storage and transportation of the raw plant material and the adding of value are important in order to obtain a good price for the herb resources and derive maximum economic benefit from them. This is why the role of well-trained collectors is also key.